LONG TERM N TRIAL AT ELORA RESEARCH STATION. PHOTO COURTESY OF HENK WICHERS. WHAT RATE OF nitrogen to apply? This is a common question asked by Ontario corn farmers and their advisors. Apply too little and corn yield may be limited. Apply too much then the nitrogen fertilizer cost is too high and the risk of environmental losses is increased. Research related to this question has been ongoing for decades, and while some progress has been made, providing farmers with an accurate and timely estimation of how much nitrogen fertilizer is required for a corn crop remains a daunting challenge. Grain Farmers of Ontario is contributing to research at the University of Guelph that is aimed at incorporating rainfall/plant available water into a corn nitrogen recommendation system, recognizing that current nitrogen recommendation systems used in Ontario do not explicitly consider the influence of water on corn available nitrogen. The research team consists of Dr. Bill Deen, Ken Janovicek, Joshua Nasielski, and Caleb Niemeyer. The team has clearly demonstrated that optimization of nitrogen rate must consider the influence that water has on corn available nitrogen. In fact, the importance of this relationship seems to be increasing. Using more than 100 nitrogen response studies conducted over the past 50 years at the Elora Research Station on silt-loam soils, it appears that optimal nitrogen rate is increasingly being influenced by water availability. Nitrogen requirement prior to 2000 was not significantly influenced by water availability, whereas since 2000 the relationship between water and nitrogen requirement is evident. What is causing this relationship to now be observed? There are several possible explanations and they all relate to the observation that corn yield potential is increasingly becoming limited by plant available water. First, in Ontario, researchers are observing a gradual decline in soil organic matter, in part due to the increasing intensity of soybean production, and this is reducing water available to corn. As organic matter declines, soil health and properties related to soil water holding capacity, water infiltration, and root exploration of water are probably also declining. Second, there is a direct relationship between corn yield and water use. 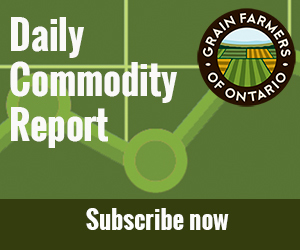 In Ontario, as corn yields have been gradually increasing, this has led to increased demand for water. Prior to 2000, lower average corn yields meant that water was less frequently the limiting factor for corn yield. Today, at higher yield potentials, water is more frequently limiting yield. Third, more variable precipitation and higher temperatures associated with a changing climate may be enhancing these effects. A 10-year nitrogen trial that was started in 2008 at the Elora Research Station with funding from the International Plant Nutrition Institute reveals the size of the relationship between nitrogen and water. The trial is on a silt loam soil, uses a continuous corn system, is moldboard plowed, has utilized only two hybrids over the 10 year period, and includes nitrogen rates ranging from only 30kg N ha-1 applied on the planter to 30kg N ha-1 applied on the planter + 230kg N ha-1 applied either at planting or at sidedress. While this trial has a number of objectives, it has enabled determination of the nitrogen rate that maximizes profitability for a given year. Surprisingly, the optimal nitrogen rate varies from approximately 140 kg N ha-1 to 260 kg N ha-1. What is surprising is that this variation is observed on a field that is only 4.5 acres, on the exact same soil, under a constant rotation, and with a hybrid that only changed once over a ten year period. So what is causing this variation and how is a farmer to predict how much nitrogen to apply? Obviously, the variation is not due to changes in soil type, rotation, or hybrid since these were all held constant. Presumably the variation is caused by weather differences across years, specifically the effects of precipitation on key nitrogen processes. For this trial, rainfall received during May and June does not explain the variation in optimal nitrogen rate observed across years, suggesting that nitrogen loss processes, such as denitrification and leaching, are not the cause of variation. This is consistent with a growing body of evidence that on medium textured soils in-season losses are not an agronomic concern, although they may be a concern on lighter or heavier textured soils. Weather also does not appear to be impacting nitrogen supply in this trial since the PSNT values are similar across years and also the corn yield of the zero nitrogen rate treatment is constant across years. If the variation in nitrogen requirement is not being caused by weather effects on soil nitrogen supplying capacity or nitrogen losses, what is causing it? Much of the variation in optimal fertilizer nitrogen rate is explained by rainfall occurring during a period approximately three to four weeks prior to corn silking, a period that corresponds with yield determination in corn. This suggests that it is water effects on corn nitrogen demand that determines optimal nitrogen rate. The implications of this finding are that late vegetative stage nitrogen applications may be a necessity to accurately estimate corn nitrogen requirement. Research in this area is ongoing with current research aiming to work with Ontario farmers to determine if this finding is true across a range of soil types and rotations. Research is also looking to develop a more accurate nitrogen recommendation system that uses rainfall/plant available water, and develop practical late vegetative stage corn nitrogen fertilizer strategies.